IF thou wishest to succeed, it is necessary to make the following Experiments and Arts in the appropriate Days and Hours, with the requisite solemnities and ceremonies contained and laid down in the following Chapters. Experiments, then, are of two kinds ; the first is to make trial of what, as Ihave said, can be easily performed without a Circle, and in this case it is not necessary to observe anything but what thou wilt find in the proper Chapters. The second can in no way be brought to perfection without the Circle; and in order to accomplish this perfectly it is necessary to take note of all the preparations which the Master of the Art and his Disciples must undertake before constructing the Circle. Before commencing operations both the Master and his Disciples must abstain with great and thorough continence during the space of nine days from sensual pleasures and from vain and foolish conversation; as plainly appeareth in the Second Book, Chapter 4. Six of these nine days having expired, he must recite frequently the Prayer and Confession as will be told him; and on the Seventh Day, the Master being alone, let him enter into a secret place, let him take off his clothes, and bathe himself from head to foot in consecrated and exorcised Water) saying devoutly and humbly the prayer, '0 Lord Adonai, etc., as it is written in the Second Book, Chapter 2. The Prayer being finished, let the Master quit the water, and put upon his flesh raiment of white linen clean and unsoiled ; and then let him go with his Disciples unto a secret place and command them to Strip them selves naked; and they having taken off their clothes, let him take exorcised water and pour it upon their heads so that it flows down to their feet and bathes them completely; and while pouring this water upon them let the Master say: Be ye regenerate, renewed, washed, and pure, etc., as in Book II., Chapter 3. Which being done, the Disciples must clothe themselves, putting upon their flesh, like their Master, raiment of white linen clean and unsoiled; and the three last days the Master and his Disciples should fast, observing the solemnities and prayers marked in Book II., Chapter 2. Note that the three last days should be calm weather, without wind, and without clouds rushing hither and thither over the face of the sky. On the last day let the Master go with his Disciples unto a secret fountain of running water, or unto a flowing stream, and there let each of them, taking off his clothes, wash himself with due solemnity, as is rehearsed in Book II. And when they are clean and pure, let each put upon him garments of white linen, pure, and clean, using the prayers and ceremonies described in Book II. After which let the Master alone say the confession. The which being finished, the Master in sign of penitence will kiss the Disciples on the forehead, and each of them will kiss the other. Afterwards let the Master extend his hands over the Disciples, and in sign of absolution absolve and bless them; which being done he will distribute to each of his Disciples the Instruments necessary for Magical Art, which he is to carry into the Circle. The First Disciple will bear the Censer, the Perfumes and the Spices ; the Second Disciple will bear the Book, Papers, Pens, Ink, and any stinking or impure materials; the Third will carry the Knife and the Sickle of Magical Art, the Lantern, and the Candles; the Fourth, the Psalms, and the rest of the Instruments; the Fifth, the Crucible or Chafing-dish, and the Charcoal or Fuel; but it is necessary for the Master himself to carry in his hand the Staff, and the Wand or Rod. The things necessary being thus disposed, the Master will go with his Disciples unto the assigned place, where they have proposed to construct the Circle for the Magical Arts and experiments; repeating on the way the prayers and orations which thou wilt find in Book II. THE CONSTRUCTION OF THE CIRCLE. Which Names are of supreme importance in the list of the Sephiroth and their Sovereign Equivalents. And at the North ADNI, Adonai. Between the two Squares the Name Tetragrammaton is to be written in the same way as is shown in the plate. While constructing the Circle, th.e Master should recite the following Psalms :Psalm ii. ; Psalm liv. ; Psalm cxiii. ; Psalm lxvii. ; Psalm xlvii. ; Psalm lxviii. Or he may as well recite them before tracing the Circle. The which being finished, and the fumigations being performed, as is described in the chapter on Fumigations in the Second Book, the Master should reassemble his Disciples, encourage them, reassure them, fortify them, and conduct them into the parts of the Circle of Art, where he must place them in the four quarters of the earth, encourage them, and exhort them to fear nothing, and to keep in the places assigned to them. Also, the Disciple who is placed towards the East should have a pen, ink, paper, silk, and white cotton, all clean and suitable for the work. Furthermore, each of the Companions should have a new Sword drawn in his hand (besides the consecrated Magical Sword of Art), and he should keep his hand resting upon the hilt thereof, and he should on no pretext quit the place assigned to him, nor move therefrom. After this the Master should quit the Circle, light the fuel in the earthen pots, and place upon them the Censers, in the Four Quarters of the Earth; and he should have in his hand the consecrated taper of wax, and he should light it and place it in a hidden and secret place prepared for it. Let him after this re-enter and dose the Circle. The Master should afresh exhort his Disciples, and explain to them all that they have to do and to observe; the which commands they should promise and vow to execute. When we enter herein with all humility, let God the Almighty One enter into this Circle, by the entrance of an eternal happiness, of a Divine prosperity, of a perfect joy, of an abundant charity, and of an eternal salutation. Let all the demons fly from this place, especially those who are opposed unto this work, and let the Angels of Peace assist and protect this Circle, from which let discord and strife fly and depart. Magnify and extend upon us, 0 Lord, 'Thy most Holy Name, and bless our conversation and our assembly. Sanctify, 0 Lord our God, our humble entry herein, Thou the Blessed and Holy One of the Eternal Ages ! Amen. 0 Lord God, All Powerful and All Merciful, Thou Who desirest not the death of a sinner, but rather that he may turn from his wickedness and live; give and grant unto us Thy grace, by blessing and consecrating this earth and this circle, which is here marked out with the most powerful and holy names of God. 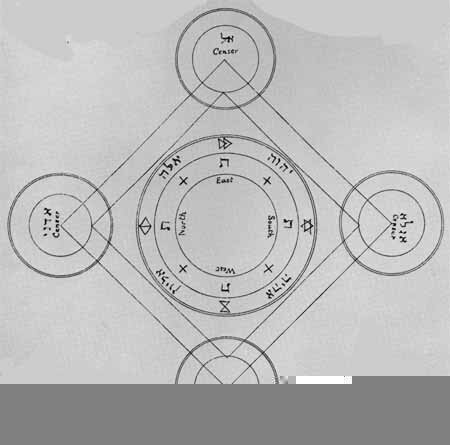 And thee, I conjure, 0 Earth, by the Most Holy Name of ASHER EHEIEH entering within this Circle, composed and made with mine hand. And may God, even ADONAI, bless this place with all the virtues of Heaven, so that no obscene or unclean spirit may have the power to enter into this Circle, or to annoy any person who is therein; through the Lord God ADONAI, Who liveth eternally unto the Ages of the Ages. Amen. Let the Master now arise and place upon his head a Crown made of paper (or any other appropriate substance), on the which there must be written (with the Colours and other necessary things which we shall describe hereafter), these four Names AGLA, AGLAI, AGLATA, AGLATAI. The which Names are to be placed in the front, behind, and on either side of the head. Furthermore, the Master ought to have with him in the Circle those Pentacles or Medals which are necessary to his purpose, which are described hereinafter, and which should be constructed according to the rules given in the Chapter on Pentacles. They should be described on virgin paper with a pen, and ink, blood, or colours, prepared according to the manner which we shall hereafter show in the Chapters on these subjects. It will be sufficient to take only those Pentacles which are actually required, they should be sewed to the front of the linen robe, on the chest, with the consecrated needle of the Art, and with a thread which has been woven by a young girl. O Lord, hear my prayer, and let my cry come unto Thee. O Lord God Almighty, Who has reigned before the beginning of the Ages, and Who by Thine Infinite Wisdom hast created the heavens, the earth, and the sea, and all that in them is, all that is visible, and all that is invisible by a single word; I praise Thee, I bless Thee, I adore Thee, I glorify Thee, and I pray Thee now at the present time to be merciful unto me, a miserable sinner, for I am the work of Thine hands. Save me, and direct me by Thy Holy Name, Thou to Whom nothing is difficult, nothing is impossible; and deliver me from the night of mine ignorance, and enable me to go forth therefrom. Enlighten me with a spark of Thine Infinite Wisdom. Take away from my senses the desire of covetousness, and the iniquity of mine idle words. Give unto me, Thy servant, a wise understanding, penetrating and subtle heart, to acquire and comprehend all Sciences and Arts ; give unto me capacity to hear. and strength of memory to retain them, so that l may be able to accomplish my desires, and understand and learn all difficult and desirable Sciences; and also that I may be able to comprehend the hidden secrets of the Holy Writings. Give me the virtue to conceive them, so that I may be able to bring forth and pronounce my words with patience and humility, for the instruction of others, as Thou hast ordered me. O God, the Father, All Powerful and All Merciful, Who hast created all things, Who knowest and conceivest them universally, and to Whom nothing is hidden, nothing is impossible; I entreat Thy Grace for me and for Thy servants, because Thou seest and knowest well that we perform not this work to tempt Thy Strength and Thy Power as if in doubt thereof, but rather that we may know and understand the truth of all hidden things. I beseech Thee to have the kindness to be favourable unto us; by Thy Splendour, Thy Magnificence, and Thy Holiness, and by Thy Holy, Terrible, and Ineffable Name IAH, at which the whole world doth tremble, and by the Fear with which all creatures obey Thee. Grant, 0 Lord, that we may become responsive unto Thy Grace, so that through it we may have a full confidence in and knowledge of Thee, and that the Spirits may discover themselves here in our presence, and that those which are gentle and peaceable may come unto us, so that they may be obedient unto Thy commands, through Thee, 0 Most Holy ADONAI, Whose Kingdom is an everlasting Kingdom, and Whose Empire endureth unto the Ages of the Ages. Amen. O Lord, be Thou unto me a Tower of Strength against the appearance and assaults of the Evil Spirits. These be the Symbols and the Names of the Creator, which can bring Terror and Fear unto you. Obey me then, by the power of these Holy Names, and by these Mysterious Symbols of the Secret of Secrets. The which being said and done, thou shalt see them draw near and approach from all parts. But if they be hindered, detained, or occupied in some way, and so that they cannot come, or if they are unwilling to come, then, the Suffumigations and Censings being performed anew, and (the Disciples) having anew, by especial order, touched their Swords, and the Master having encouraged his Disciples, he shall reform the Circle with the Knife of Art, and, raising the said Knife towards the Sky, he shall as it were strike the air therewith. After this he shall lay his hand upon the Pentacles, and having bent his knees before the Most High, he shall repeat with humility the following Confession; the which his Disciples shall also do, and they shall recite it in a low and humble voice, so that they can scarcely be heard.